Posted by Mrs Weird Scientist in Easy As Pie, Technology. 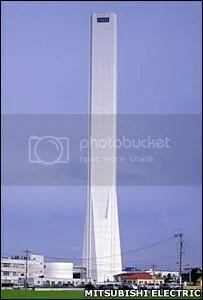 Mitsubishi Electric in Japan has opened what they say is the world’s tallest elevator testing tower. It’s called Solae and it practically owns the skyline at 567 ft (173 meters) high! Mitsubishi Electric plans to use this testing tower to test out new gears, drives, cables and various other lift systems. The tower will also be used to learn more about high-speed elevators. Why is it important? Think about all of the super tall buildings, which just keep on getting bigger and taller. Mitsubishi Electric’s new elevator testing tower will help to ensure that elevators can continue to meet the rigorous demands of the enormous towers that penetrate the skyline. Currently, the world’s tallest building is the Taipei 101, which stands in at 1,666 ft and 508 meters. The lifts in the Taipei 101 are among the fastest anywhere in the world, clocking in at a maximum speed of 17 meters per second, which translates to 61 kilometers per hour or 38 miles per hour. Even more technologically advanced is the fact they comprise a pressure control system that prevents your ears from ‘popping.’ The lifts themselves are also designed with a streamlined shape to reduce the whistling noise that can occur as the lift moves rapidly through a confined, narrow space. Imagine living or working in a building with one of these fast lifts? It would be like taking a roller-coaster ride every day! Sign me up!